The house 1/9 is well known to Smolensk citizens and it is located on the corner of the Communist and Mayakovsky streets. This motley building is familiar to many people as P.A. Budnikov’s House. It is an object of cultural heritage and serves as a vivid example of Russian style in Smolensk. Preserved decor of Smolensk Budnikov’s house is of great artistic interest as an art and crafts monument. 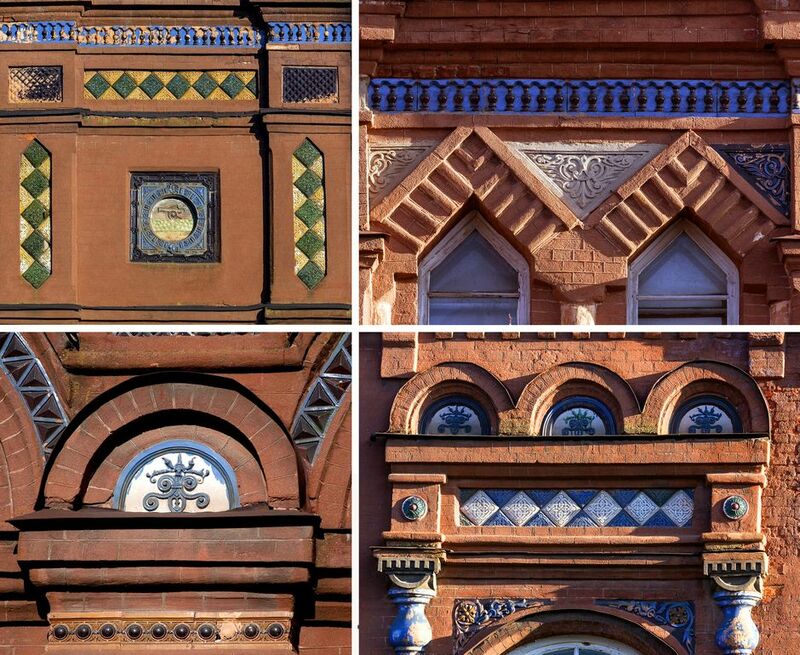 In the outer decoration of buildings are widely applied irrigated multicolored tiles of different sizes and shapes. 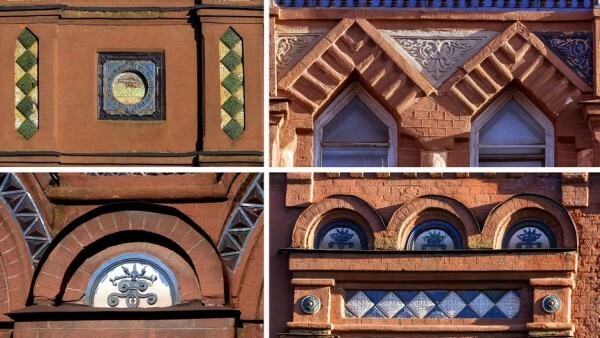 There are styled ancient Russian forms in the decoration: the curb, square decorative brickwork, kokoshniks, composing semi-columns with the cuboidal capitals, balusters, tiles. It is known that before the revolution in Russia houses were often called the by the name of their owners, but what is remarkable: he merchant himself hasn’t ever lived in this house. So why does the house have such name and why the name of the pre-revolutionary merchant from Smolensk is inscribed in the history of Smolensk forever? Petr Andreevich Budnikov was one of the greatest entrepreneurs in the pre-revolutionary Smolensk. Budnikov family came from the middle class of Vitebsk province. His Father was the owner of a ceramic factory in Vitebsk. Having received from father his entrepreneurial experience, in 70 -ies of the 19th century Peter Andreevich Budnikov with his wife Pavla Semyonovna and the daughter Zoe moved to Smolensk, and in 1877 founded his own ceramic manufacturing – the tile-dalle factory. The refractory bricks and tiles, tile, ceramic vases, portable stoves, fireplaces, tiles and majolica (a special type of ceramic, glazed) were produced in the P.A. Budnikov’s factory, moreover, it was the first time the one began producing of glazed facing bricks for the outside and inside building surface in the region. Brick buildings that gave extraordinary beauty and protects against moisture, so special Budnikov bricks exported abroad and used there in great demand. At the turn of 1880-1890 years in Smolensk settled significant military garrison, thus there was a need in the construction of buildings for the Officers’ meeting. The constructing of this building began in 1895. It is not surprising that all the external and internal cladding was produced at the Budnikov factory. In the outer facade decoration were generously used multi-colored tiles of different sizes and shapes. Above the balcony, located in the compositional center of the building, was put the Smolensk emblem, made from majolica. Unfortunately, its facing has not survived until today, but the tiled decor on the facade of the building still pleases the eye. In 1896 after the unveiling of the House Officers’ Assembly merchant Budnikov was awarded the gratitude and a gift from His Imperial Highness Grand Duke Vladimir Alexandrovich, the post-commander of the troops of the Guard in that time. The name «Officers’ Meeting» was fixed for this house almost on the decade. In the middle of the last century P. Budnikov’s house was called «a shining example of how the architectural structure can provide service in visual advertising products factory.» After seeing this beauty, everyone will want to afford such. Currently, in the House of P. Budnikov is located a municipal educational institution of additional education for children — the Palace of Children and Youth of the city of Smolensk.